This manikin is perfect for those looking for a wooden replica that is easy to use, quality made, and beautifully sculpted. Drawing horses, ponies, and other varieties of equines can be difficult. However, with the right manikin or representation, it just became that much easier! The WOODEN PONY MANIKIN is a great option for those looking for a durable and high quality manikin. The pony is the smaller manikin pictured and comes in a natural finish. It is made of durable wood, and is fully articulated to fit any posture (do horses have postures?) required. 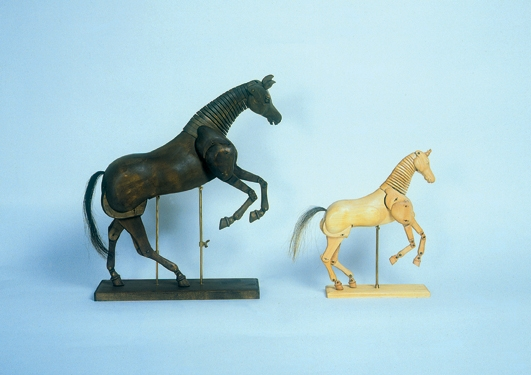 Much like human figure manikins that are used so often to get an accurate depiction of human movement and resting positions, artists can move the pony manikin to simulate gait, resting poses and more. At 36cm X 24cm,it is small, compact and perfect for the artist on the go. The compact size also makes it easy to store and use in just about any location or situation. I do not advise anyone buys these. They are poor representations. The one advertised as being of a pony (rather than a horse) is simply a smaller version of the horse version. However, anyone who has observed equines knows that ponies LOOK rather different to horses in structure and shape.